Batroc (Georges Batroc) is a fictional supervillain appearing in American comic books published by Marvel Comics. Created by writer Stan Lee and artist Jack Kirby, the character first appeared in Tales of Suspense #75, 1966. He is a mercenary and a master of the French form of kick boxing known as savate. Writer Mark Waid described the character as ahead of his time, elaborating "He was a Jean-Claude Van Damme, but he was in the 1960s." Georges St-Pierre plays the character in the 2014 film Captain America: The Winter Soldier. Batroc, created by Stan Lee and Jack Kirby, first appeared in Tales of Suspense #75 in March 1966. He has reappeared in various Marvel titles ever since. Sporting a new costume designed by John Romita Jr., Batroc served as Klaw's top lieutenant in the first arc of the 2005 re-launch of Reginald Hudlin's Black Panther. Georges Batroc was born in Marseille, France, and served in the French Foreign Legion. He is a French costumed mercenary who specializes in savate (also known as "La Boxe Française"), a form of kickboxing, with acrobatic skills and articulate unusual flexibility. Although he has primarily appeared in the pages of Captain America, he has also faced off against the Punisher, Spider-Man, Deadpool, Hawkeye, Iron Fist and Gambit. Batroc has occasionally led his own team, "Batroc's Brigade", although the membership has changed over time. The group has primarily fought Captain America. In the character's first appearance, he was hired by Them to steal the Inferno-42 cylinder. He first battled Captain America during this mission. When Batroc introduced himself with typical bluster, Cap revealed, to Batroc's delight, that he had already heard of the mercenary: "Batroc the Leaper, eh? A master of la savate, the French art of boxing with the feet!" Later, he was again hired by HYDRA and abducted Sharon Carter for them. He lured Captain America into a rematch, in which he insisted HYDRA not intervene, and again lost; however, when HYDRA agents prepared to kill both Cap and himself, Batroc, incensed at such "men wizout honair," switched sides to help Cap against HYDRA. In both of these stories, Batroc was regarded as a deadly combatant, his skill respected by enemies and employers alike. Batroc was then hired by a foreign power to locate a "seismo-bomb" with the first known Batroc's Brigade (consisting of the original Swordsman and the Living Laser). Batroc battled Captain America again. The Machinesmith's Baron Strucker android known as "the Hood" then hired a new Batroc's Brigade (consisting of Porcupine and Whirlwind) to battle Captain America. Batroc then formed a third Batroc's Brigade, which consisted of various unnamed henchmen, rather than known supervillains, since supervillains had failed Batroc in the past. The alien Jakar, concealing his true nature and intent, hired this group to abduct children from New York and to battle Captain America and Falcon. Although Batroc felt no compunction about abducting children, upon learning Jakar's true nature and his intent to use the children's souls to revive his comatose race, he felt his "sense of honair" had been violated by the deception, and he again switched sides, aiding Captain America and the Falcon to rescue the children. Ward Meachum then hired Batroc's Brigade, who battled Iron Fist and a ninja warrior, several Brigade members dying in the process. For a while after that, Batroc operated without a Brigade. Alongside an extra-dimensional demon ally, Batroc attempted a theft of transuranium, but was stopped by Captain America and Spider-Man. Batroc was also a member of the ersatz "Defenders", a group of villains who were impersonating the actual Defenders. They committed robberies while posing as members of the Defenders, until stopped by a Defenders contingent. Alongside Mister Hyde, Batroc attempted an extortion scheme against Manhattan. He battled Captain America, but when Mister Hyde decided to carry out the threat, which would kill thousands, Batroc, again showing that there were some lines he would not cross, aided Captain America against Hyde, saving the city. Batroc then formed a new, longer-lasting lineup of Batroc's Brigade - this one consisting of Zaran the Weapons Master and Machete. This team was first seen when Obadiah Stane contracted them to steal Captain America's shield and Batroc finally succeeded. Trick Shot then hired Batroc's Brigade to battle Hawkeye. Baron Helmut Zemo then hired Batroc's Brigade to acquire the fragments of the Bloodstone. They battled Captain America and Diamondback. The brigade was later hired by Maelstrom to help him build a device that could destroy the universe and battled the Great Lakes Avengers. Alongside Snakebite, Batroc also battled the Punisher. Later, Batroc the Leaper showed up as a member of a small army of villains organized by Klaw to invade Wakanda, which included Rhino, Radioactive Man, the Cannibal, and the villainous Black Knight. He was defeated by Black Panther's royal bodyguards. During the crossover JLA/Avengers, Batroc briefly confronted Batman when he was one of the villains recruited by Krona for his army. The Dark Knight defeated him (off-panel). Batroc's Brigade then face Batman, but he is assisted by Black Panther, Huntress and Black Widow, in defeating the Brigade. Batroc has a daughter who is teamed in villainy with the daughter of similar B-list supervillain Tarantula. Both daughters take their fathers' respective costumes and titles. Taskmaster expresses his shock that Tarantula and Batroc are heterosexual before soundly beating the two villains' offspring, tossing them effortlessly off of a building, noting that he also "hates ethnic stereotypes." Batroc briefly served among the group of villains forcibly drafted into Baron Zemo's Thunderbolts army. But after returning to federal custody, Batroc registered with the Superhuman Registration Act, and was sent to a superhuman training facility located at Marine Corps Base Quantico in Virginia to train recruits in martial arts before being transferred over to Camp Hammond. Ultimately, however, Batroc found government work unsatisfactory and returned to his mercenary life, confronting the new Captain America while on a job to steal an item from the United Nations. Also, he was working with The Man with No Face, a mysterious being from Captain America's past. It is soon revealed that Batroc was stealing the original Human Torch's remains for reverse engineering. During the Secret Empire storyline, Batroc the Leaper appears as a member of the Army of Evil. He, alongside Living Laser and Whirlwind, attack a haggard, bearded man in a torn World War II army uniform who identifies himself as Steve Rogers. He is assisted by people that appear to be Sam Wilson and a Bucky Barnes with both his arms. Batroc the Leaper has no superhuman abilities, but is in peak physical condition in every respect. He is an Olympic-level weightlifter and has extraordinary agility and reflexes. His leg muscles are particularly well developed, enabling him to leap great distances equal to an Olympic athlete. He is an expert martial artist and hand-to-hand combatant who specializes in Savate (French-style kickboxing), although he is also adept at other martial arts such as Krav Maga. He is also skilled in Parkour. He is also a skilled military tactician, having formerly been in the French Foreign Legion. Batroc is also an experienced thief and smuggler, and can speak both French and English. Although, as a mercenary, he does not hesitate to perform any number of criminal acts for his clients, Batroc has a strong sense of honor; he will turn against any client who he feels has unfairly deceived him into committing crimes to which he might not otherwise have agreed. The Ultimate Marvel incarnation of Batroc the Leaper is a French jewelry thief. This version's martial arts skills are also present. When he and his thugs were robbing a jewelry store, they're stopped by the new Spider-Man's "venom strike". In the MC2 continuity, Batroc the Leaper still operates his own criminal syndicate, until stopped by American Dream. A zombiefied version of Batroc the Leaper appears in the third installment of the Marvel Zombies series, where he is killed by Absorbing Man's trademark concrete ball and chain. In the alternate continuity of the 2005 "House of M" storyline, Batroc the Leaper is a member of the Hood's extensive-criminal empire. He participated in the takeover of Santo Rico and stayed to fight when the Red Guard came, to protect the sapiens population. He was the first of them to die, attacked by Agent Toad and terminated by two S.H.I.E.L.D. 's soldiers. In "Deadpool Kills the Marvel Universe Again," Batroc appears alongside Bullseye as one of two mercenaries sent by Red Skull to kill Deadpool after he starts killing off villains. They are ambushed by Deadpool however and Batroc ends up decapitated by Deadpool. 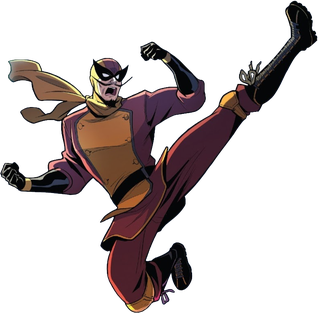 Batroc the Leaper appears in the Captain America segment of The Marvel Super Heroes, voiced by Gillie Fenwick. Batroc the Leaper appears in The Super Hero Squad Show episode "Stranger From a Savage Land", voiced by A. J. Buckley. He assists Sabretooth, Thunderball, and Toad into stealing Zabu from the Super Hero City Zoo. Batroc the Leaper appears in Black Panther, voiced by JB Blanc. He is among the supervillains recruited by Klaw to invade Wakanda. Batroc the Leaper makes a brief appearance in the Avengers: Earth's Mightiest Heroes episode "The Big House". He appears as one of the many villains incarcerated in one of the four prisons as Mad Thinker explains to fellow prisoner Whirlwind. Batroc the Leaper appears in Ultimate Spider-Man, voiced by Rob Paulsen in a French accent. In this series, his moniker "the Leaper" stems from a pair of exoskeletal leg bracers which enhance his kicking and leaping power. He is also capable of scaling up vertical walls, providing that they have footholds for him to brace his feet against. In the fourth season, HYDRA upgrades him with a full-body exoskeleton formed from pure energy. Batroc the Leaper appears in Captain America: The Winter Soldier, portrayed by French Canadian former UFC Welterweight Champion Georges St-Pierre. He appears as an Algerian mercenary who is holding a S.H.I.E.L.D. ship hostage. Captain America, Black Widow and a group of S.H.I.E.L.D. agents rescue the hostages. Batroc then has a fight with Captain America, but is eventually defeated and later escapes. He is captured by Alexander Pierce and brought in for questioning, but is seen to remain silent during interrogation. Nick Fury later reveals he hired Batroc to hijack the ship to give him an excuse to send Black Widow on board so she could steal confidential S.H.I.E.L.D. files pointing to a HYDRA conspiracy that involved HYDRA infiltrators within S.H.I.E.L.D. Batroc the Leaper appears as a mini-boss in Spider-Man and Captain America in Doctor Doom's Revenge. Batroc the Leaper appeared in Marvel: Avengers Alliance. Batroc can be confronted in Wakanda, should the player choose to take on the White Gorilla terrorists under Dell Rusk's advice. Batroc the Leaper appears in Marvel Heroes. The player can go to Industry City and find him in one of the events that take place there. A six-inch Batroc action figure was released as part of Hasbro's Marvel Legends toy line in 2015. ^ Misiroglu,Gina Renée &Eury, Michael, The Supervillain Book: The Evil Side of Comics and Hollywood, 2006, p. 439. ^ Avengers: The Initiative #1. ^ American Dream #2. Marvel Comics. ^ Marvel Zombies 3 #3. Marvel Comics. ^ "Batroc". Behind the Voice Actors. Retrieved September 25, 2014. ^ "Why I Hate Gym". Ultimate Spider-Man. Season 1. Episode 6. April 29, 2012. Disney XD. ^ Johnston, Mike (March 25, 2013). "UFC's GSP lands role in Captain America sequel". Sportsnet. Archived from the original on March 26, 2013. Retrieved March 25, 2013. ^ Zalben, Alex (March 7, 2014). "Exclusive: Marvel's 'Avengers Alliance' Gets 'Winter Soldier' And 'Guardians of The Galaxy' Upgrades". MTV. This page was last edited on 29 March 2019, at 08:33 (UTC).